I am now about two and a half days post-gum surgery, and I was feeling well enough to get out of the house today! I'm still a bit sore and swollen, but that will improve as the week goes on. My energy was closer to normal today, so things are definitely improving. Today, while Rainbow was at Sunday School and the Mister was on a run, I started plying. I didn't get very far, but at least I got a little bit of a preview of the finished yarn. This shot is a bit deceptive, because there were a couple of color changes before this point. I've found that thus far two of the three plies have more or less matched for a while or all three plies are sort of vaguely the same shade. It does look like I should have a fair amount of striping in the finished yarn, which should make for a fun knit! I'm going to try to put in time on this skein during the week so that, with any luck, I can have it finished up by next weekend. I'm plying on my miniSpinner, and I have to say that my body is enjoying the additional rest it's giving me. It's Election Day in the United States. Normally this would not be big news, as it's not a year we vote for president, but this year it's taken on more importance. All seats in the House of Representatives and some seats in the Senate are up for election. Here in Pennsylvania, we're also voting for positions in the state legislature and governor. I know that some people are not interested in politics and feel a bit apathetic about voting in any election that they feel isn't a "big" one. Me? I have voted in every single election I've been eligible to vote in since I turned 18, even the ones that some might consider inconsequential. The right to vote is so sacred, so special. It's something that people have literally given their lives for. In the not-so-distant past, people of color -- who legally had the right to vote -- were denied that right. Women have had the right to vote for less than 100 years (if you haven't already read it, go read Ann's post on the Mason-Dixon blog today). Voting isn't hard and doesn't take a long time; it actually took longer for the poll worker to find my card today than it took me to fill out and submit my ballot! So please, if you are a registered voter in the United States and haven't yet voted, take some time to get to the polls today. Appropriately, I am wearing my new socks for the first time today! These socks were cast on in the car on the way to Rhinebeck, and my intention was the have them finished in time to wear today (so mission accomplished!). The first sock pretty much flew off the needles and was completed on the drive home; the second one took a bit longer as I was working on it primarily during my lunch break at work. Other than using a different needle size (because I was worried that using the called-for US 1/2.25 mm would give me a gauge that wasn't too durable), I made two notable modifications to the pattern as written. First, I substituted my usual heel flap and turn for the one given in the pattern. The one in the pattern is a bit different from what I'm used to, and I knew that to do it would require me to pay close attention to the pattern; as I was knitting on the first sock while in the booth at Rhinebeck, I knew that wouldn't be a good idea. So I subbed in my usual heel so that I wouldn't have to think too hard. The second change was to the stitch pattern itself. As written, the traveling stitches are accomplished through a paired make 1 and left-leaning decrease. I did that for my first round of traveling stitches on the first sock and didn't like how it looked (I ended up with a bit of a hole from the m1), so after that I changed it to a simple two-stitch left-crossing cable. There's nothing wrong with the pattern as it is; I was just unhappy with my execution of it. Overall, the pattern is great, and the stitch pattern, while involved, is intuitive; I didn't need to refer to the pattern except occasionally after the first couple of repeats. Following the shooting at Tree of Life, I, like many people, felt a bit helpless. And like most knitters, I wanted to do something with yarn and needles to somehow improve the situation. So when my friend Cortney (who grew up in Pittsburgh as well) contacted me about starting an effort to knit and crochet kippot/yarmulkes for Tree of Life, I knew I not only had to participate but to design something as well. The result, modeled so nicely here by The Mister, is called To Life. It uses a very small amount of yarn -- mine used only 10 g, less than 50 yards -- making it perfect for leftovers and mini skein, and it knits up very quickly. 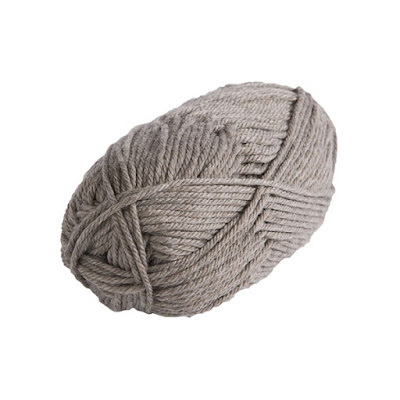 It's constructed using a series of triangular wedges formed by short rows, and the beauty of the fact that it's all in garter stitch means that you don't have to worry about picking up wraps. I've made it available on Ravelry for $1, and I'm donating all the proceeds to Tree of Life -- I'm even going to make up the cut that PayPal takes. I know that a couple of people have told me that they wish I'd made the price a little higher, but I wanted to make it accessible to everyone (and I will add that more than one person has bought multiple copies in one transaction to make their donation a bit larger). 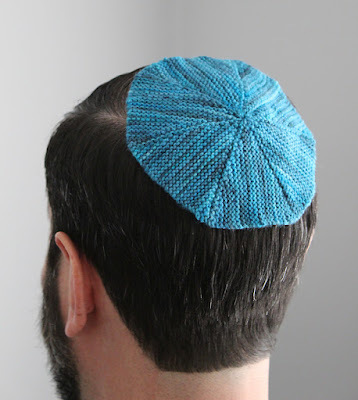 Cortney and I have also opened a thread in the Jewish Fiberaholics group on Ravelry for those who want to knit kippot to donate to Tree of Life or a synagogue more local to them (some people have also mentioned making kippot to auction off and then donating the proceeds). If you feel like this is something you'd like to do, please feel free to join us! It has been a restful weekend -- and certainly a happier one than last weekend. I had hoped to get more spinning done over the past couple of days, but after giving blood on Friday, I found I just didn't have much energy. I sat down at my wheel on Friday night as I usually do but had to call it quits after about an hour; my legs just couldn't treadle anymore. So unfortunately I don't have a finished third bobbin of singles for my combo spin as I'd hoped, but I did at least get a bit of time with my spinning. This third colorway is very much the wild card in the combo spin, as it is more unlike the other two than they are compared to each other. It has some of the same pink/purple that the other two braids have, but it also has this light sea foam green and some tan. I'm going to try to put in some more spinning time during the week with the hope that I can finish up this last bobbin of singles and be able to ply next weekend. Next weekend, at least, there will be plenty of time for crafting: I'm having oral surgery (for the third time) on Friday morning, so there's not much I can do for the rest of the day but rest. Although that will mean having an ice pack to my face off and on all day, I'm hoping I can MacGuyver something to hold it in place and keep my hands free to knit or spin.